I tend to celebrate holidays on the day closest to the actual day... so to celebrate Martin Luther King Jr. we celebrated this past Tuesday (after our Monday holiday). One activity we did was to discuss his famous quotes and then the kids personalized them by telling what it means to them (and a little illustration). The quotes came from All Clip Art as free clip art. I just stuck them onto a powerpoint slide, and copied to fit at least 3 per sheet. 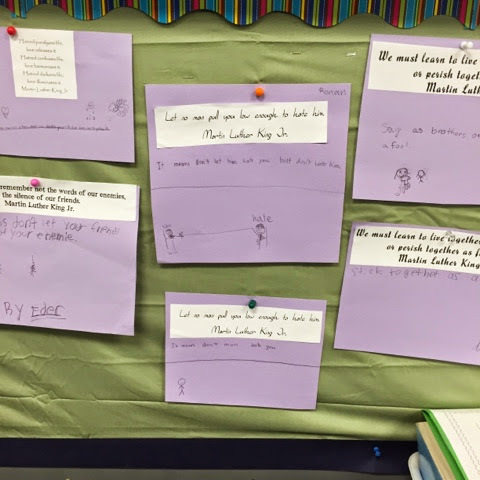 Then when it was time to write about them, I had the kids choose what quote they related to the most, they glued it onto their paper, and the rest is history. 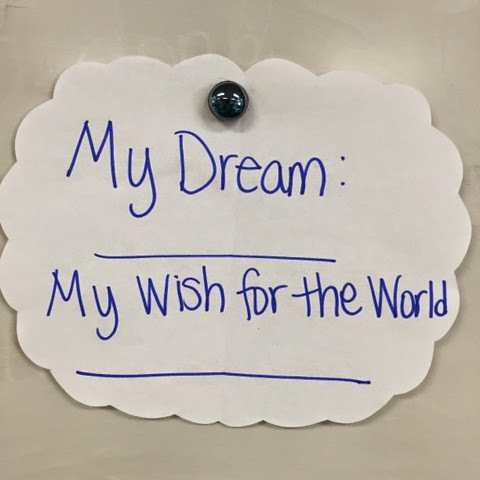 Every year to celebrate his birthday I have my students brainstorm their own dream and wish for the world. 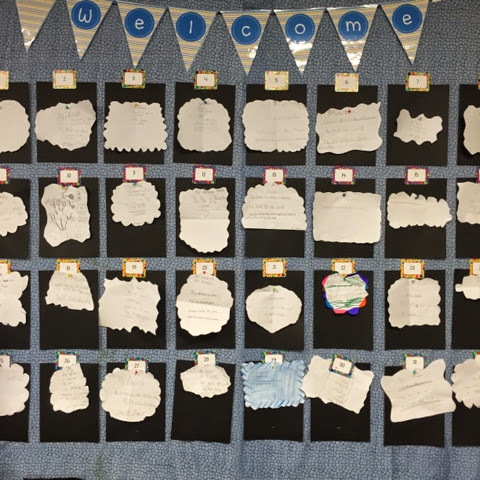 Since my 4th graders need to practice their cutting skills (I'm being serious), I had them make a cloud/dream bubble and brainstorm on top. 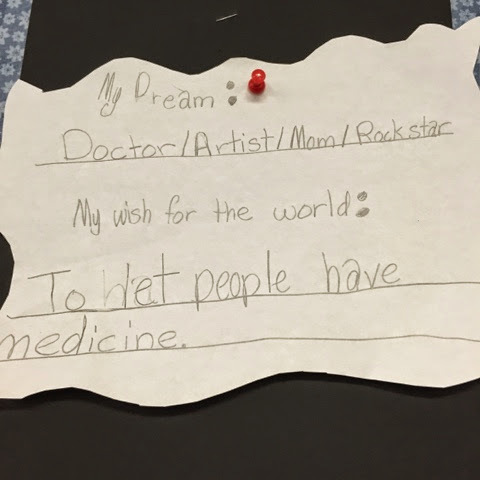 I especially love this one below about being all 4 things - doctor, artist, mom, and rockstar. Dream big! In class we also watched the Brain Pop movie about Martin Luther King Jr, and in the computer lab the kids had a chance to look up every more information about him. Then in groups I had them fill in the posters by Elementary Lesson Plans. 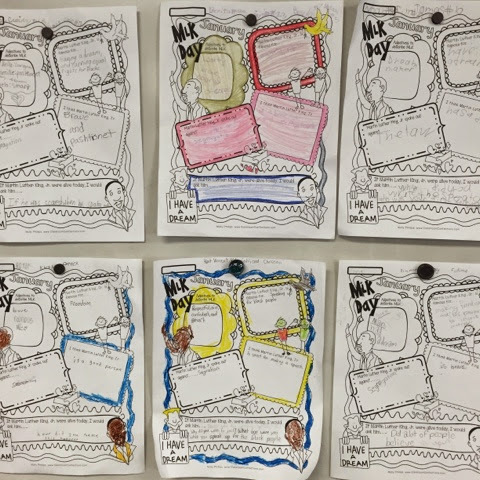 How did you incorporate Martin Luther King Jr. into your lesson plans? Hope this gave you some ideas for next year! I'm back! This past week was a doozy. 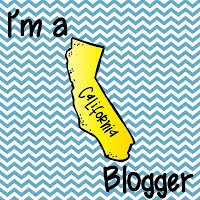 My husband had pneumonia, my youngest son had bronchitis, and I had a math observation. Fun times? NOT! Anyhow, I know I've shown this idea before, but it bears repeating. Basically I hand out index cards and the kids take 1 or 2 (depending on how many examples I want them to create). 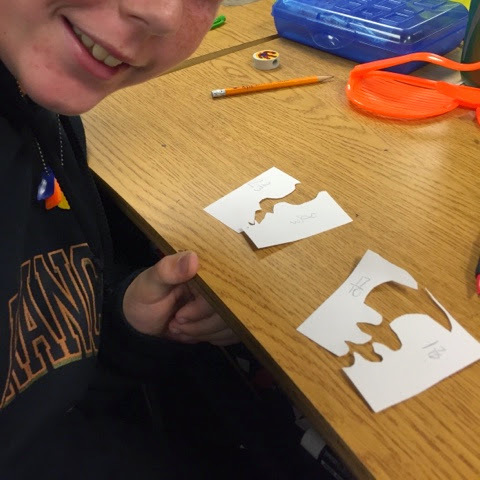 With the index cards they cut them in half to double the amount of cards. Then each square is cut down the middle in some kind of shape (zig zag, snake, etc). The 2 sides of the puzzle must meet together perfectly to make a self checking puzzle. Then on one side they write the Mixed Number, the other is the Improper Fraction. 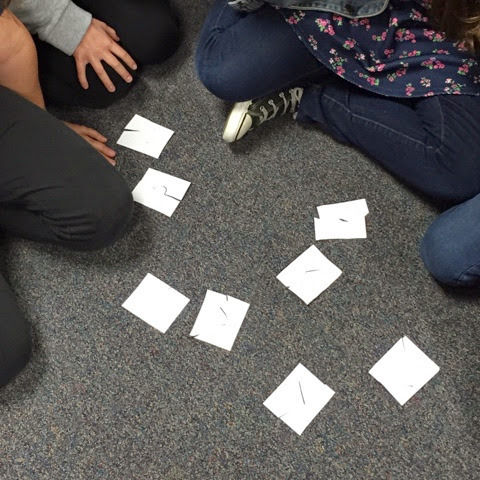 The kids then take their pieces to a partner or group, mix up the pieces, and match them up again. When they get done with those partners, they switch groups. 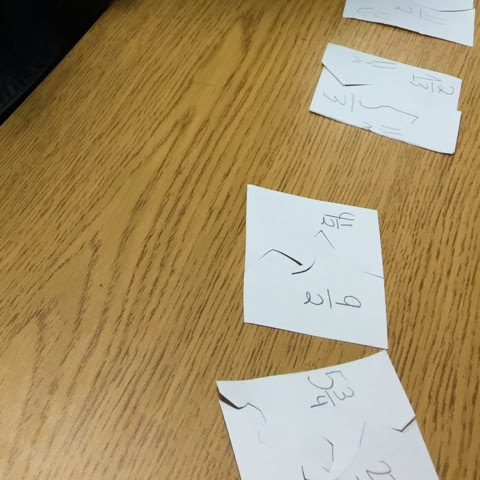 We've done this with story vocabulary - words vs. definitions, addition/subtraction/multiplication/division - problem on one side, answer on the other, equivalent fractions, etc. The kids LOVE making their own puzzles. Do you have school today? I'm off! LOVE 3 day weekends. 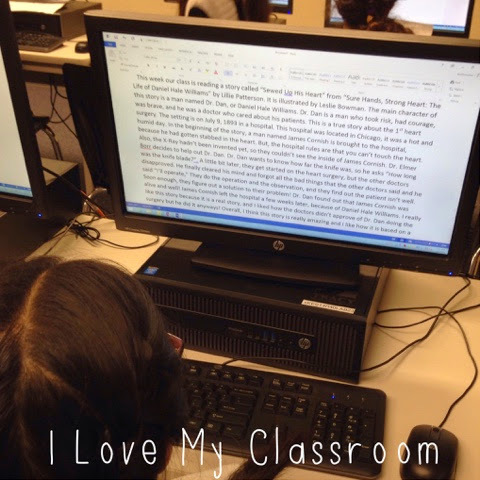 My students love to type. Well, that generalization probably isn't true, but they have learned the importance of knowing the keyboard, and they are physically excited when I announce it's time for the computer lab. This year our school received a 2nd computer lab to help us get ready for all the online testing that is coming, which means that my 4th graders get computer access 2x a week (instead of once every other week of past years). On Tuesdays we head in for 40 minutes and I have them type their summaries of our weekly story. It's been amazing watching the transformation throughout the year. When we first started many spent the entire time on a single word or sentence, now we are up to full paragraphs with quotations. They love having the ability to personalize their text with color, font, etc... They know the keyboard! We create our story maps back in class, so they bring it and their texts with them to type. Near the end of the session they raise their hands and I run walk quickly around the room reading their one paragraph on the screen, and giving a grade on their writing. If they get less than half of it completed they need to hand write the summaries in the classroom. It's motivation to get it done. On Thursdays when we go in for 30 minutes, the students are taking AR tests, taking math tests, practicing skills on IXL or our My Math program, playing games on Fun to Type, or whatever else I have for them to do. I am so thankful for technology and I really feel my students are going to be ready for all the typing they will complete during the upcoming assessments! What do you do in the computer lab?